Just when it looked as if the market was going to do what was widely expected of it in October, keep climbing, the market decided to remind everyone that it can go down from time to time. Thus far, the high flying technology stocks have been hit the hardest with NASDAQ dropping nearly 400 points over the last seven trading sessions. NASDAQ (chart above) has dropped through projected monthly support (green dashed line) and its 50-day moving average (solid magenta line). NASDAQ’s 200-day moving average (solid red line) is nearly 250 lower just below 7500. NASDAQ has not traded below its 200-day moving average since July 2016. Stochastic and relative strength indicators applied to NASDAQ are near oversold, but MACD has yet to sink to an extreme level. S&P 500 and DJIA have also retreated. S&P 500 is currently trading right around its projected monthly support level (green dashed line) and its 50-day moving average (solid magenta line). S&P 500’s pullback has been milder than NASDAQ and its Stochastic, relative strength and MACD indicators are not as deeply negative. If it can hold current levels then higher would be the most likely direction. If current support fails and S&P 500 continues to head lower, its 200-day moving average at 2765 could be in play. Thus far DJIA has held up the best. 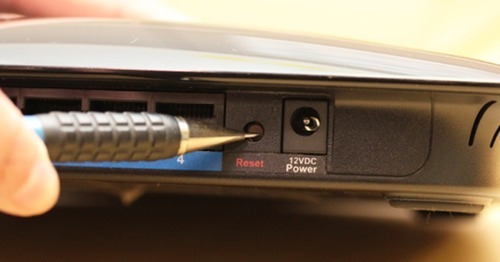 It most recently traded at a new all-time and has sold off the least. 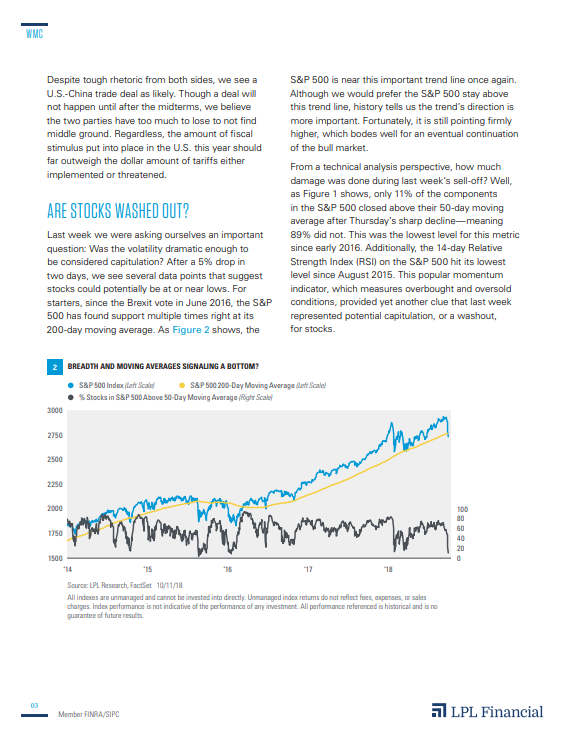 Its technical indicators are confirming recent weakness, but are not signaling oversold. DJIA is also modestly above its projected monthly support level (green dashed line) and its 50-day moving average (solid magenta line). 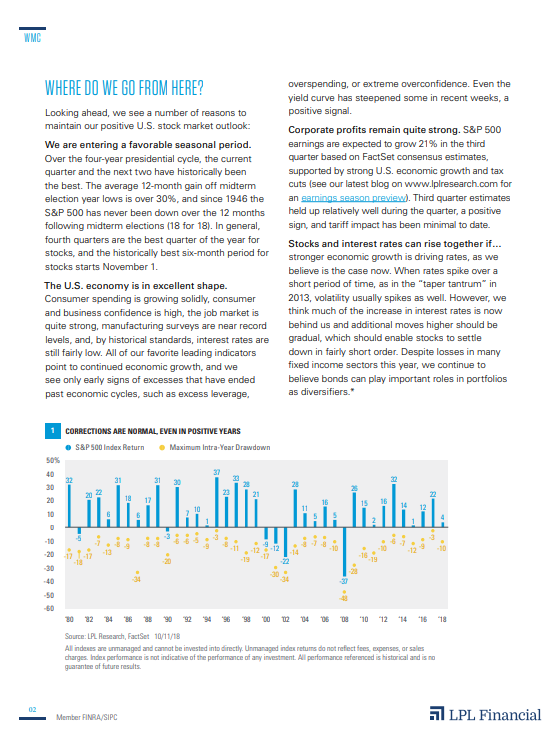 Provided economic data remains firm, the Fed doesn’t get overly hawkish and bonds yields don’t move much higher any quicker, the current pullback will likely end up being a buying opportunity ahead of the historically “Best Months” for the market, November through April and the Sweet Spot of the four-year-presidential cycle. Lately, it seems that there hasn’t been a whole lot of positive data coming out of the residential housing sector, but this morning we actually received some good news for a change. 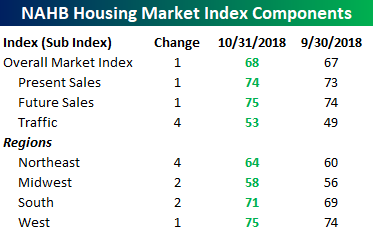 According to the National Association of Homebuilders (NAHB), homebuilder sentiment for the month of October unexpectedly increased from 67 up to 68 versus estimates for a decline to 66. In spite of this month’s increase, the index is still off of its high of 74 that was hit right at the end of 2017 when the GOP tax plan was passed. Breaking out this month’s report by sales, traffic, and regions shows gains across the board. As shown in the table below, Traffic saw a big surge rising from 49 back into positive territory at 53. 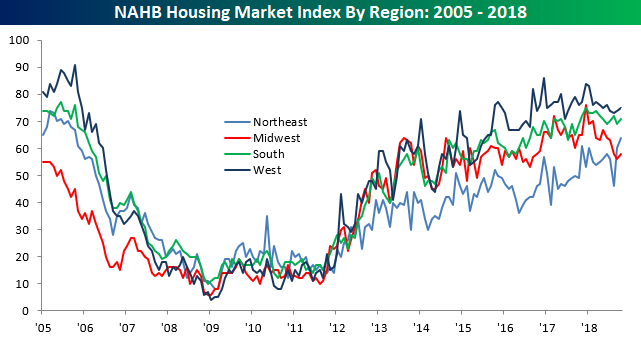 From a regional perspective, sentiment improved in all four regions of the country, but for the second straight month, homebuilders in the Northeast saw the biggest boost to sentiment and it is the only region of the country where sentiment is at a high for the cycle. Finally, some good news out of the housing sector! Industrial production growth in September was forecasted to fall to 0.2% from August’s reading of 0.4% MoM. The release for September came in higher than expectations at +0.3%. On a 3m/3m annualized basis, September’s data is still below where it has been for most of the year though. Mining has continued to be a key driver in the aggregate production measure this year. Even with over a 3% decline from the prior period, mining production rose 11.42% on a 3m/3m annualized basis. A big portion of this mining production comes from strength in oil and gas. Manufacturing saw a nice bounce thanks to much stronger automotive production. On the industry level, we have seen a substantial recovery of autos. 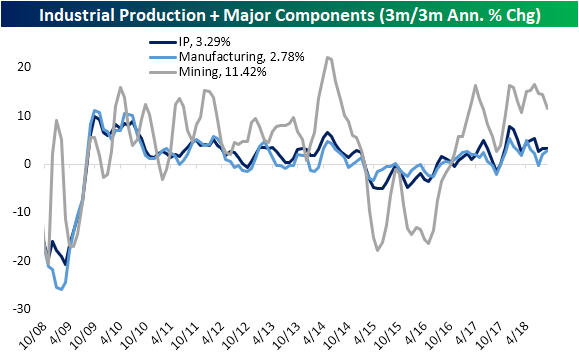 As one of the major components that make up aggregate industrial production, it is a good sign to see this industry picking up steam. Only a couple months ago—back in July—the industry was at a multiyear low of -18.01% annualized on a 3m/3m basis. Since then, it has climbed all the way back to 9.79% through September. 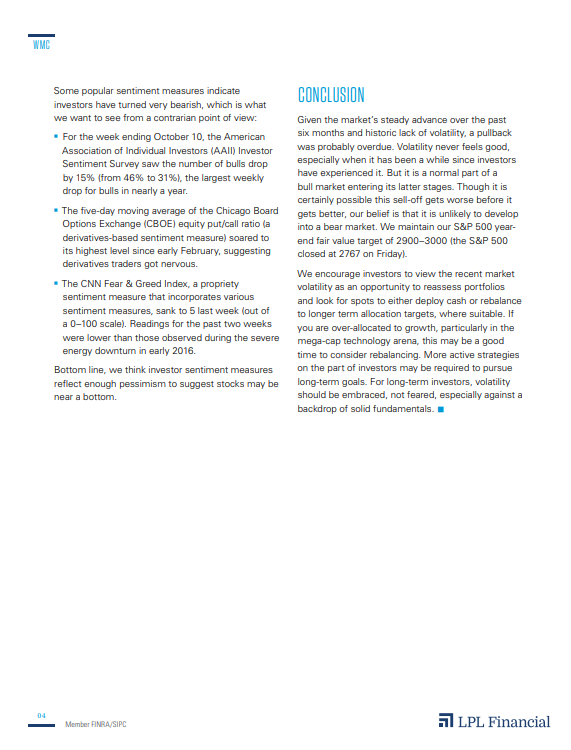 This comes on the back of September’s stronger than expected auto sales that was released earlier this month. This could bode well for the automotive industry which has been soft since the end of 2017. 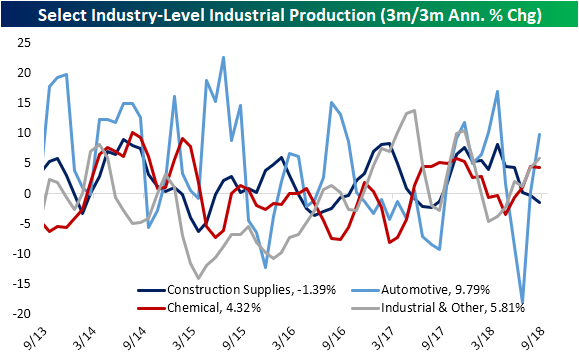 Unfortunately, the strength in autos for this month was not reflected in construction supplies which fell again to -1.3% annualized 3m/3m. This is nothing new for this year as many housing and construction data points have been consistently weak. 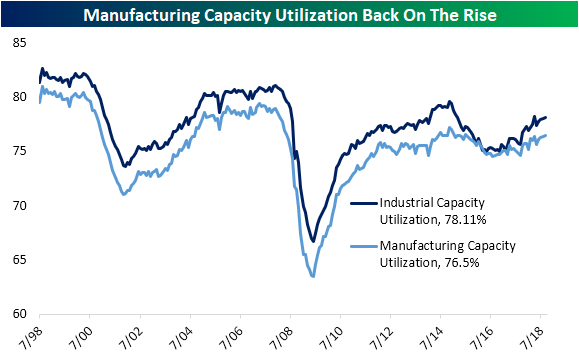 After bottoming out in 2016, both industrial and manufacturing capacity utilization have been on the move upwards. Industrial capacity utilization has yet to take out its high from back in April, but it has seen consistent moves higher over the course of the past few months. Today’s release forecasted capacity utilization to increase to 78.2%. Instead, September’s release came inline with August at 78.1%. Manufacturing utilization, on the other hand, did surpass its high in September. It is now at its highest level since July 2015. On a longer time frame though, capacity still has not reached pre-recession levels. 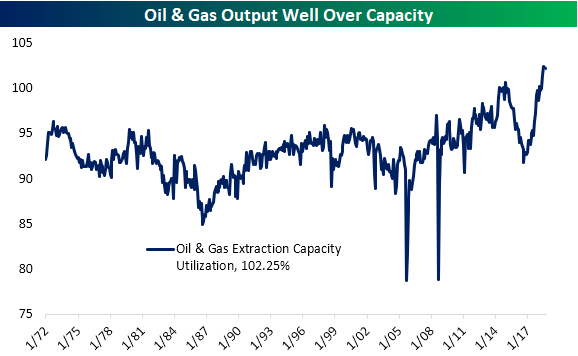 Despite a very small downtick for September—moving to 102.25% from 102.28%—oil and gas are still producing at levels over capacity. 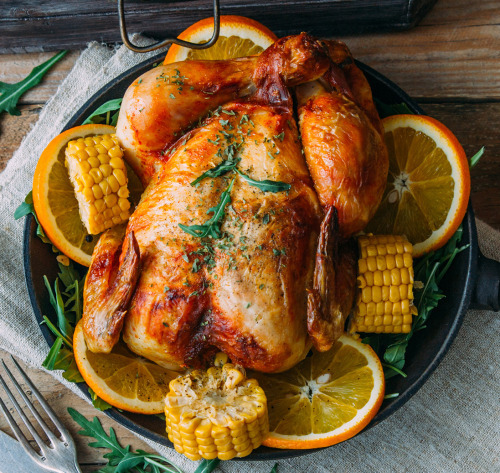 As international trade tensions surrounding these products mount, it should not come as any surprise that US producers are working overtime to make up the difference. 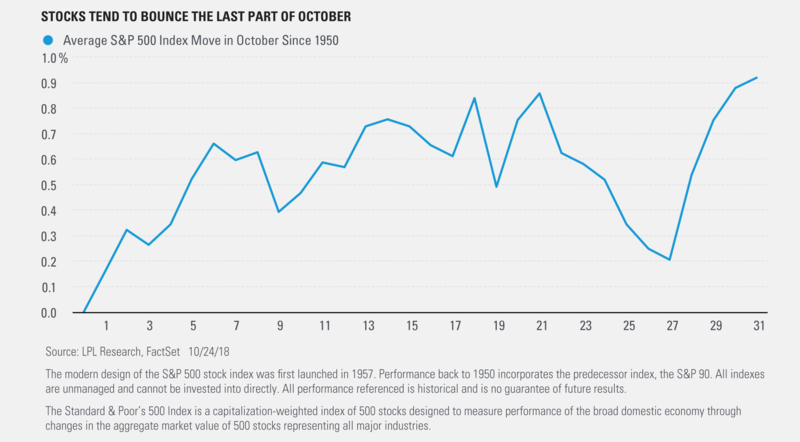 After six straight months of equity gains for the S&P 500 Index and one of the least volatile quarters ever, the historically volatile October is living up to its name. 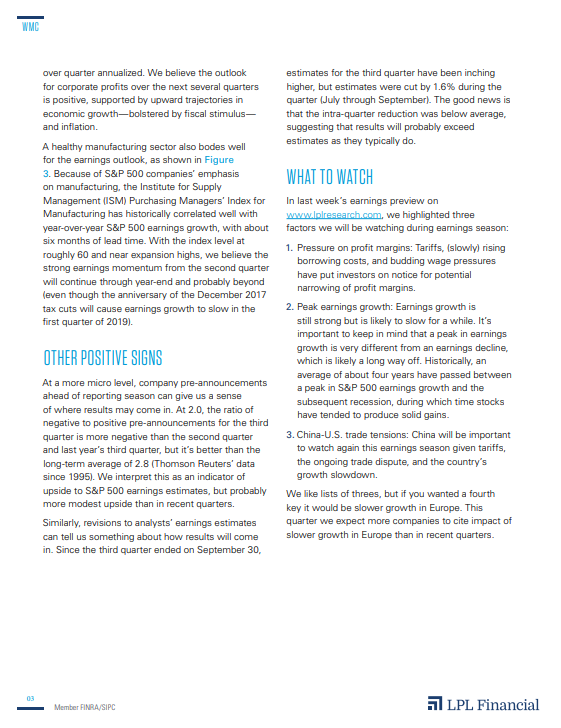 However, earnings continue to be very strong, and we see very little reason to expect a recession over the next 12–18 months. By no means are investors out of the woods yet, as we wouldn’t be surprised to see more weakness and volatility before the midterm elections. Remember, the S&P 500 dropped for nine straight days ahead of the U.S. election in November 2016. Nevertheless, there may be a silver lining for the bulls. As our LPL Chart of the Day shows, the majority of stock gains in midterm years have come late in the year. 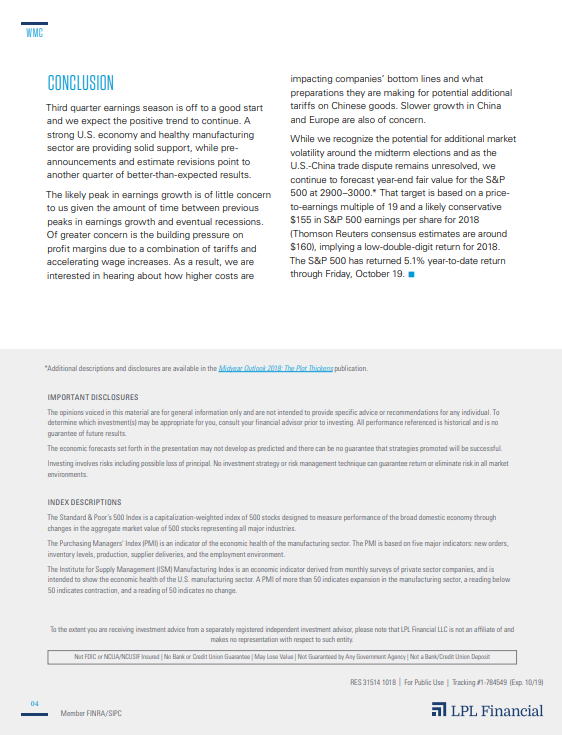 “Midterm years have tended to be the most volatile out of the four-year presidential cycle, and wouldn’t you know it, nearly all the gains for the year tended to happen in the final few months,” explained LPL Research Senior Market Strategist Ryan Detrick. On average, the S&P 500 actually has been negative year to date ate in early October during a midterm year. Importantly, markets can be jittery ahead of major events like elections. Once the uncertainty is resolved in November, solid fundamentals and strong seasonals could take over for a nice year-end rally. In the month or so since these charts were last updated, the market has undergone a swift pullback in typical seasonal fashion, in October. As of today’s close, DJIA is up just 2.4% year-to-date. S&P 500 is fractionally better at 3.1%. NASDAQ is doing best, as it has been for the majority of the year, up 8.2%. 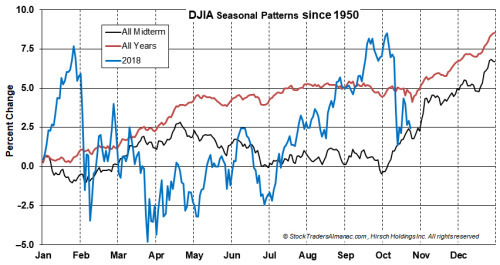 DJIA’s performance is just above its historical average midterm year at this time of the year. S&P 500 is also just above its average midterm performance while NASDAQ is currently well above average for midterm and sitting right above its average in all years. The current pullback, during the “Worst Six Months” of the year, May through October, does have a something of a silver lining. 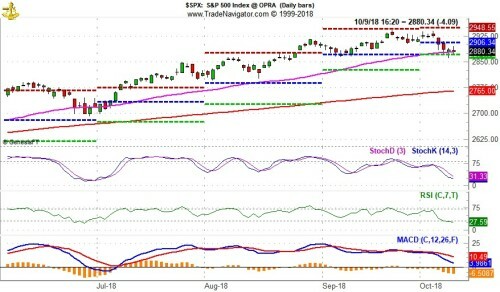 Whether it was triggered by the Fed and interest rates or not, the pullback has caused valuations to retreat and become more attractive and frothy levels of bullish sentiment have also eased. 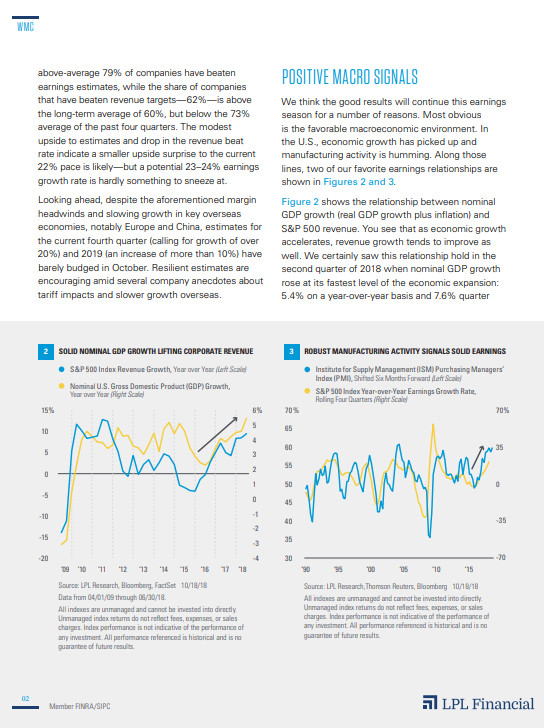 Provided economic data remains firm, corporate profits continue to beat and the Fed continues to toe the line, then this pullback is likely to end up being a launching pad for a solid fourth quarter/yearend rally. It’s been a rocky ride so far in October, but there is a silver lining. 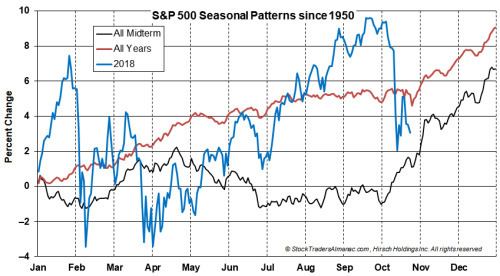 “Incredibly, the S&P 500 during a midterm year has never finished lower if you bought the October low and held till the end of the year,” explained LPL Senior Market Strategist Ryan Detrick. Of course, no one can pick a market low with any consistency, but with October about to end, it is safe to assume the low happened last week or will happen over the next few days. As our LPL Chart of the Day shows, the past 18 midterm years saw the S&P 500 Index gain from the October lowest close until the end of the year every single time—up 10.6% on average. Given the average year since 1950 is up 7.4% on average from the October lows, midterm years can see even more strength to end the year. 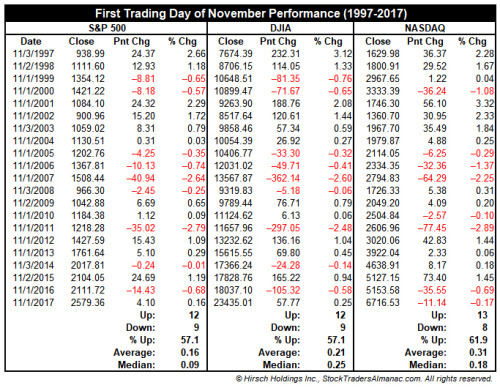 Based upon data in the soon to be available Stock Trader’s Almanac for 2019 on page 86, the first trading day of November is the fifth weakest of all monthly first trading days since September 1997 based upon total DJIA point gained. 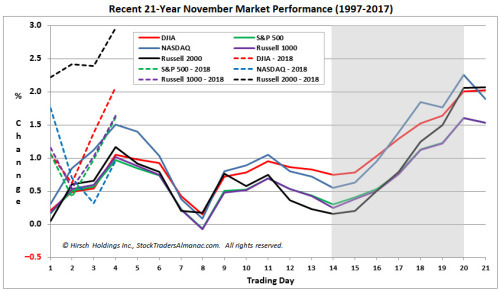 DJIA and S&P 500 have been up 12 of the last 21 years on the first trading day of November. NASDAQ has the best record, up 13 times with an average gain of 0.31%. 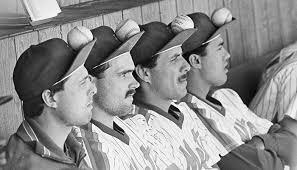 If today’s gains hold through the close, it is time to put your rally caps on. We have been patiently awaiting a turn like this and some technical confirmation. Now that everyone remembers the “Sell in May” is not dead, we can focus on the “Best Six Month” and the Sweet Spot of the 4-Year Cycle. 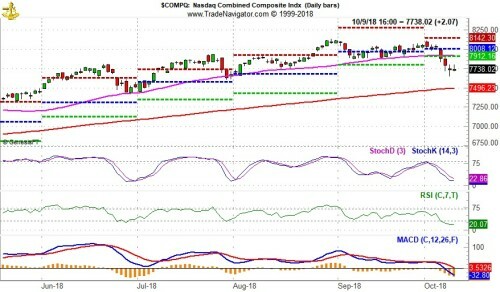 The chart below highlights the clearly oversold condition as measured by the NASDAQ 100 (NDX). The chart comes from the venerable Tom McClellan (@McClellanOsc) of The McClellan Oscillator and McClellan Financial Publications, a widely followed and relied upon indicator and service by market technicians and serious traders, investors and analysts. It was brought to our attention by a one of trusty loyal newsletter subscribers Bill in LA. 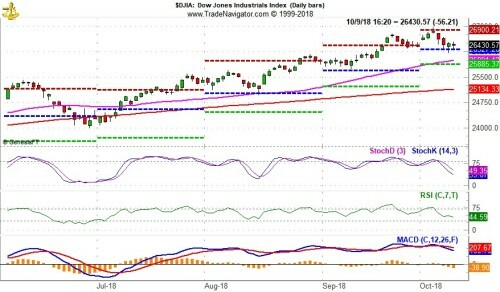 It looks like Tom McClellan’s NDX Oversold Indicator is confirming our analysis that the stock market is ready for its annual and perennial rip. Well, it’s a good thing that October is over. In the end, the S&P 500 Index lost 6.9%, for the worst month since September 2011. Besides being the worst month for the S&P 500 in seven years, the Dow Jones Industrial Average lost 5.1% for its worst month since January 2016, while the Nasdaq’s -9.2% return marked its worst month since November 2008. The big loser was small caps though, as the Russell 2000 Index fell 10.9%, its worst month since September 2011. The six-month win streak for the S&P 500 is officially over. Want some good news? 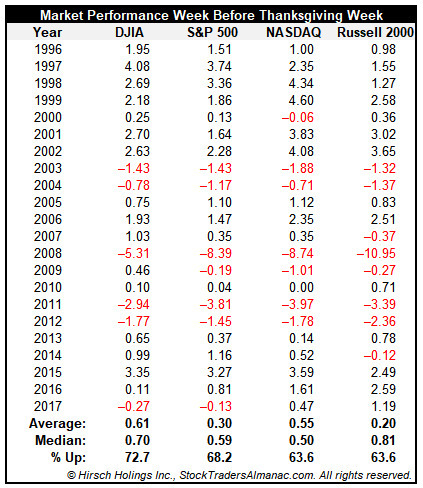 Since 1990, it has had 10 other 6-month win streaks, and the index was higher every single time 12 months later, up 13.6% on average. The S&P 500 fell 16 days during the month, tying the most down days for any one month since October 2008. The first back-to-back up days for the S&P 500 took place on the final two trading days of the month, with the index gaining more than 1% each day. This occurred nearly right on cue, as the end of the month tends to see the best moves. 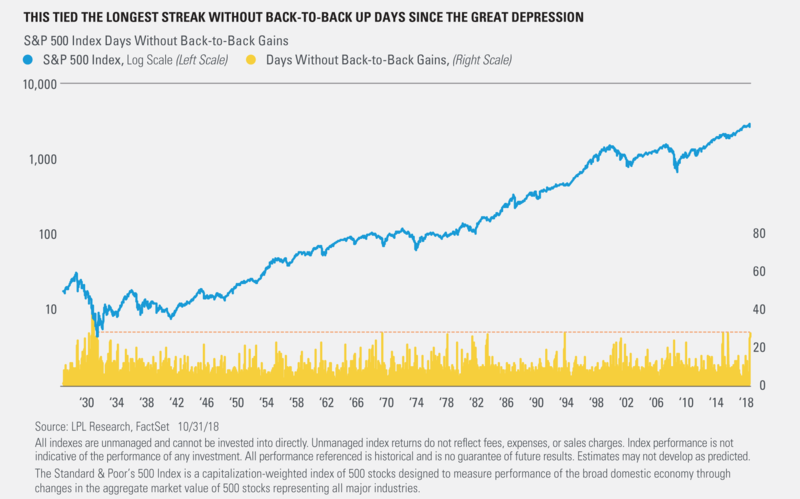 In fact, the S&P 500 had gone 28 consecutive trading days without back-to-back up days. As our LPL Chart of the Day shows, that tied the longest streak going back to the Great Depression. That sums up how persistent the selling has been recently. 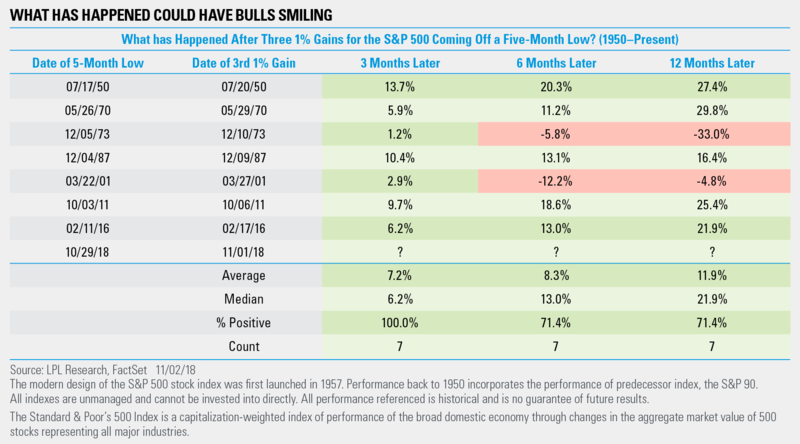 After not a single 1% move up or down during the entire third quarter, the S&P 500 saw 10 changes of at least 1% up or down last month. That was the most for any month since 12 changes back in February 2018. October even had four changes of at least 2%, for the most since January 2016. Lastly, turning to the Dow, in terms of the cumulative intraday range for the Dow during October, it moved a total of 9,872 points. Only February 2018 and October 2008 had larger movements. 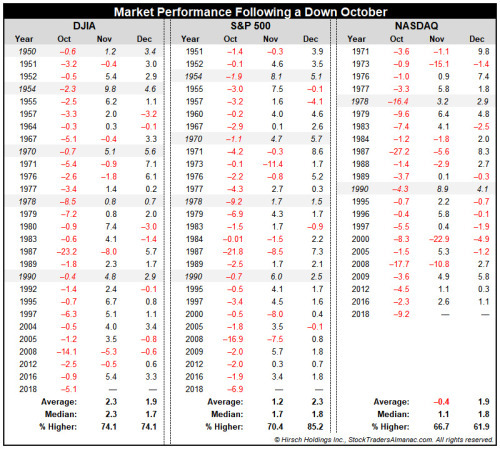 “October was a rough ride, and most investors are likely quite happy to wave it goodbye. 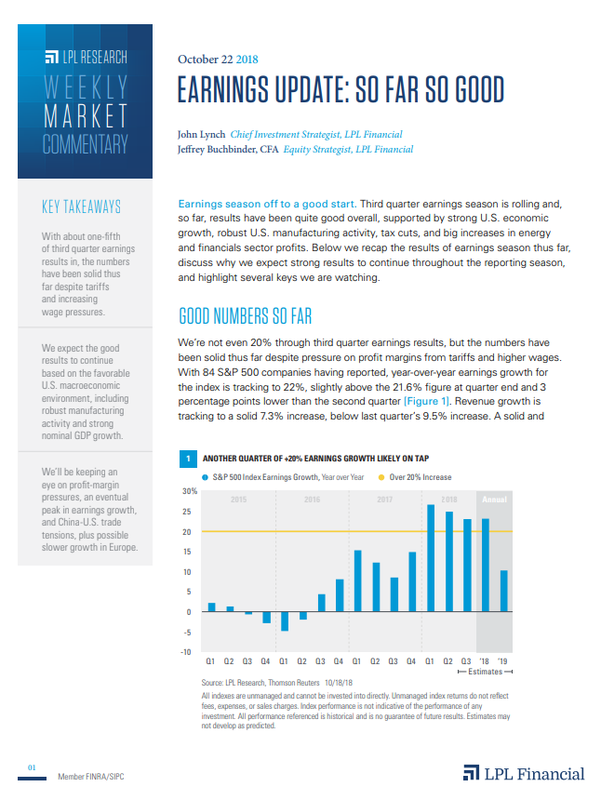 The good news remains that valuations are the lowest they’ve been in years, earnings continue to surprise to the upside, and November and December during a midterm year are historically quite strong,” summarized LPL Senior Market Strategist Ryan Detrick. What a difference a week can make. Last Tuesday the S&P 500 Index closed at a new five-month low and there were many growing concerns. From China trade issues, to peak earnings, to slowing global growth, to a potential Federal Reserve policy mistake—the list added up to the worst month in nearly seven years for the S&P 500. Well, extremely oversold markets can bounce, and did we ever see a rare bounce last week! In fact, the S&P 500 gained at least 1% on three consecutive days for the first time since right after the Brexit vote in June 2016. Turns out, markets making a new five-month low followed by three strong days in a row tend to continue climbing higher. 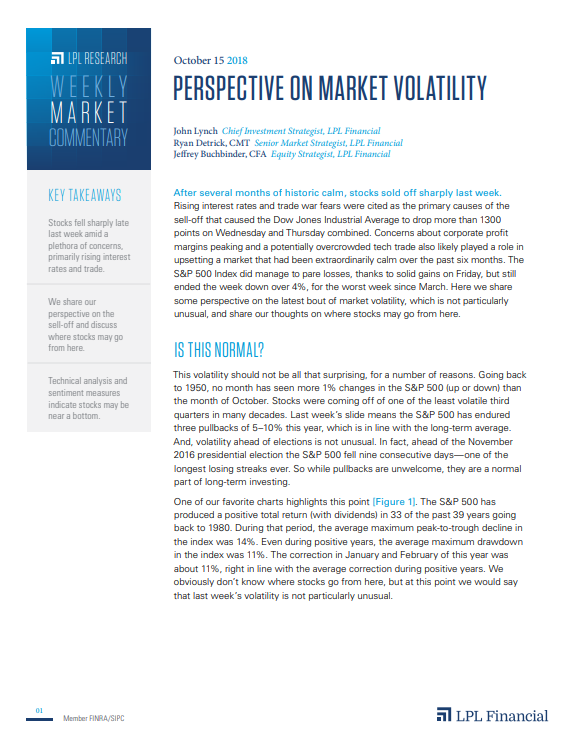 “Last week’s extreme market strength from oversold levels could be just what the bulls needed. We’ve had so much bad news lately, this could be the turning point,” explained LPL Senior Market Strategist Ryan Detrick. As the LPL Chart of the Day shows, stocks have never been lower three months after the S&P 500 reached a five-month low and was then up 1% three days in a row. The returns 6 and 12 months later have been quite strong as well. In fact, the two times future returns were weak were during the recession of ‘73/’74 and the tech bubble recession. Non-recessionary environments have been rather strong, a good sign given we don’t anticipate a recession over the coming 12 months. Tomorrow is Midterm Election Day. Prior to 1969 the market was closed on Election Day. In the midterm elections since 1970, Election Day has been bullish with S&P 500, DJIA and NASDAQ (since 1974) all posting average gains. The day after Election Day, when results are in, is also bullish, but with even larger gains and a higher frequency of advancing days. Unlike the candidates on the ballots, the market mostly only cares that the election is over as it has historically moved higher afterwards. 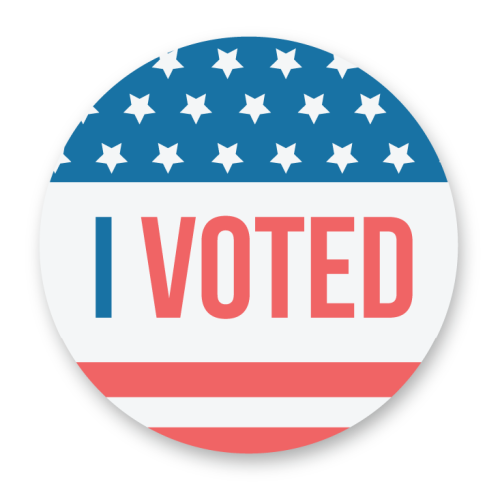 Later today the first of the day’s election results will begin to trickle in and if history is any guide, the results will likely have a minor impact on the market. This is the “Sweet Spot” of the four-year cycle for the market. 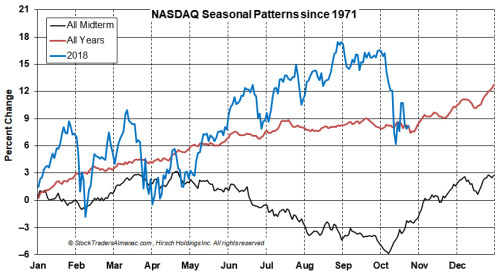 In the following chart the 30 trading days before and 60 days trading days after the last 17 midterm year elections appear (NASDAQ since 1974). 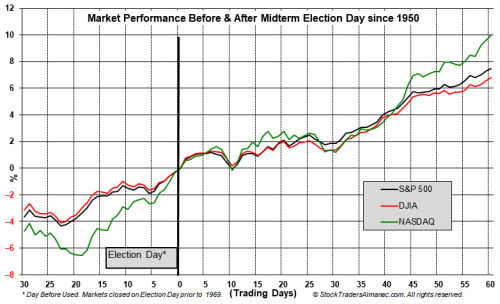 Prior to 1969 the market was closed on Election Day so the close on the day before was used. By 60 trading days after the election (approximately three months), DJIA, S&P 500 and NASDAQ were all higher on average from 6.8% to nearly 10%. 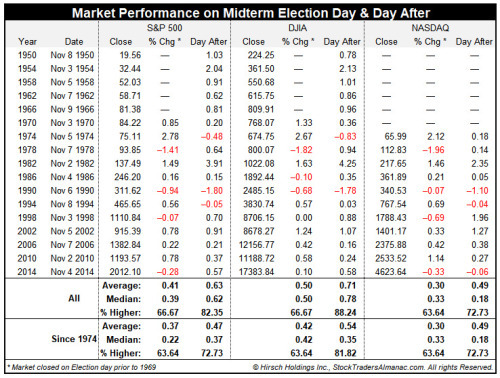 Digging deeper into the data, the following table shows S&P 500 performance 1-, 3-, 6- and 12-months after the midterm elections since 1950. 1- and 3-months after the election S&P 500 was higher 82.4% and 94.1% of the time respectively. By 6-months and 1-year after, S&P 500 was always higher, although gains did slow after 6-months. The years the President’s party lost control of the House of Representatives are shaded in grey. Here at LPL Research we’ve shared many charts over the past few months regarding midterm years and midterm elections. Here are five of the best ones. 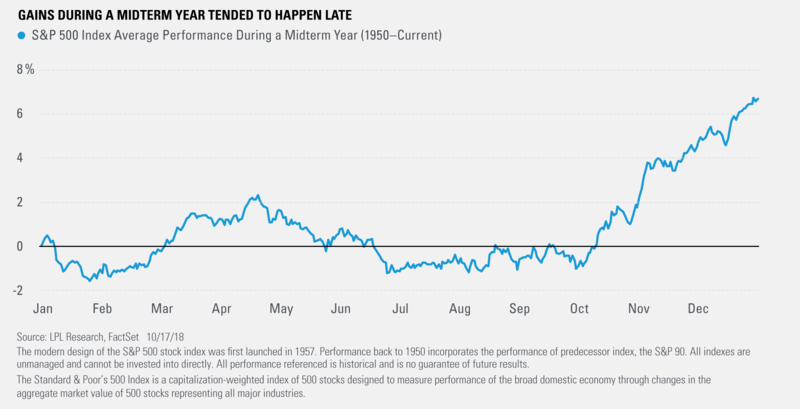 Chart 1 – Most equity gains tend to happen late in the year during a midterm year. Chart 2 – Since 1946, the S&P 500 Index has been higher 12 months after every single midterm election. That’s 18 for 18. Chart 3 – The S&P 500’s closing low for the month of October was October 29. 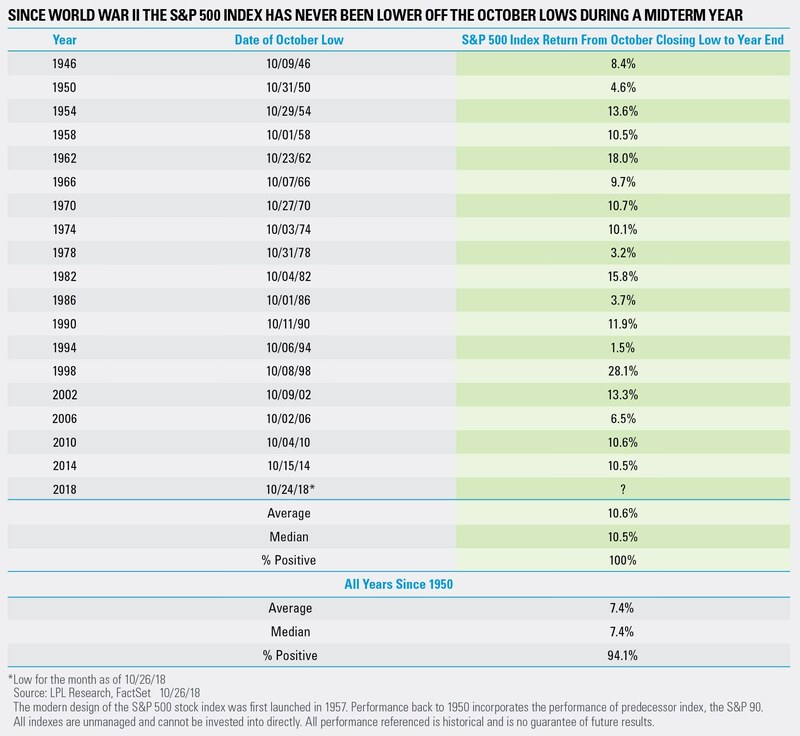 Since 1950, the S&P 500 gained more than 10% on average from the October low close until a mid-term election year. Chart 4 – Under a Republican president, the best scenario for stocks has been a split Congress. This is the most likely scenario after today’s elections, according to most Washington insiders. Chart 5 – The fourth quarter of a midterm year historically have been the best quarter of the four-year presidential cycle. Not to be outdone, the next two quarters have been quite strong as well. Those last 3 posts...Good stuff....thanks @bigbear0083, those are quite the statistics. As of the market’s close yesterday, DJIA was up 2.07% thus far in November. S&P 500 was higher by 1.61% and NASDAQ was higher by 0.96%. Small-caps, measured by the Russell 2000 were performing the best, up 2.96% over the first four trading days in November. 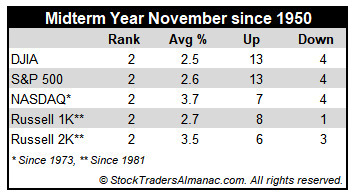 Current gains are consistent with the historical trend of early November strength. However, historically early strength has faded after the fourth trading day. Election results coming in line with expectations has extended strength this year. Mid-month, from around the fifth trading day until the fourteenth trading day, has been choppy. From there until the penultimate trading day of November the market has historically booked solid gains. Recently the last trading day has been prone to more weakness than strength. 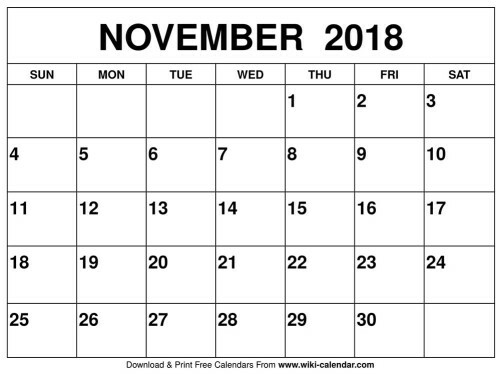 In addition to this week being options expiration week, this week is also the week before Thanksgiving week. This overlap occurs in most years, but not all. November 2013 would be the most recent example when they did not overlap. After today’s declines, the market will need a strong showing to return to the black by the end of the week. Nonetheless, the overall bullish bias that options expiration week exhibits also exists during the week before Thanksgiving week. Over the last 22 years, DJIA has advanced 72.7% of the time during the week. DJIA has gained an average of 0.61% to S&P 500 0.30%. NASDAQ and Russell 2000 are slightly weaker, up just 63.6% of the time with average gains of 0.55% and 0.20% respectively. Steep losses occurred in 2008 during financial crisis and 2011 also hosted sizable losses.